I’m sure most are aware that there has been some delay in getting the pebble blue version of the Samsung Galaxy S3 out there to the public, with the reason for the delay with the blue model reportedly being manufacturing difficulties; however it appears that the first batch of blue coloured Galaxy S3 devices have arrived. According to an article over on International Business Times, retailers in the Netherlands have now received their first batch of the Samsung Galaxy S3 in blue, albeit not the Pebble Blue, but rather a Metallic Blue with the Metallic Blue version of the Galaxy S3 now posted as available to the website of Phone House. Furthermore, Dutch retailer CoolBlue has announced via their Twitter account announcing that the blue Samsung Galaxy S3 has arrived and will be allocated to those customers at the top of their waiting list, and those should receive their blue Galaxy S3 be the week’s end, whilst another Dutch retailer, Castle Telecom has apparently also emailed their Galaxy S3 customers with the same info. Phone House is the Dutch branch of the Carphone Warehouse, and a Phone House employee has apparently stated that the blue model of the Samsung galaxy S3 is a tad different in colour to the blue Galaxy S3 shown off in London. Whist according to the article a report by Android Authority says that the pebble blue version of the Android Ice Cream Sandwich smartphone might be replaced with a different colour called Metallic Blue; however this information has yet to be confirmed. 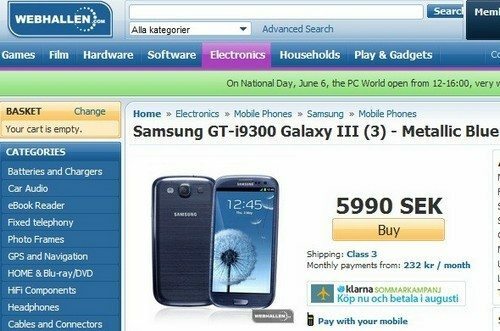 Although apparently Swedish online store, Webhallen put up a message on their website stating that the Samsung Galaxy S3 Metallic Blue model is available to purchase, but actually posted pictures of the Pebble Blue SGS3. That’s great……Blue is my favorite color. I wish i will get also in blue color not in white.